Prague, the capital of the Czech Republic and the former capital of the Bohemia, is home to some of the most beautiful and historic sites in the world. Situated in the north-west of the country, on the Vltava River, Prague is a picturesque city of 2 million residents with a mysterious, old fashioned charm. It has played an important part in the European history, and is home to a number of famous cultural attractions. Prague also boasts a number of luxurious accommodations, such as The Prague Marriott Hotel. This hotel in Old Town Prague welcomes travelers with an upscale destination in the heart of the city, pampering guests with elegant accommodations and attentive service. With nearly 300 spacious guest rooms and 35 meticulous suites, the hotel offers a variety of accommodations and remarkable hotel deals in Prague so guests can create an ideal travel experience whether visiting for business or leisure. 1. Amazing off season deals: It is a great time to explore special offers and deals in accommodation, entertainment, sights, shopping and tours. One great way to enjoy Prague is with the Prague Marriott Hotel's Spring Getaway Package, which includes a full American breakfast, high-speed internet access, and a complimentary spring cocktail at the bar. 2. Delicious cuisine: Taste the traditional Czech food and flavorful Czech beer in one ofPrague's restaurants. If you want to have a culinary experience in a romantic way, just enjoy a picnic at one of the Prague's parks with the nice view of Prague Vinohrady, Kampa or at Letná area. 3. Beautiful weather for a stroll: The best way to get to know Prague is by walking around. Spring and summertime sun are ideal for enjoying some delightful walks with the necessary snack- and coffee-grabbing stops. Start the day with walk through Old Town Square, over the Charles Bridge up to Prague Castle. Once there, you can admire the breathtaking views from the Petrin Tower. 4. Fewer crowds, more comfort: One of the best parts of visiting Prague in the off season is that you don't have to wait to visit museums, sites, galleries, etc. You have the luxury of time and space; you will enjoy some great views, sights and happenings. 5. The views from the river: For a romantic experience with your loved one, easily rent a private paddle boat for two and admire the fantastic castle complex together with the Charles Bridge, National Theatre with a bottle of champagne. Visiting Prague in spring or summertime is a temptation! You get to enjoy great benefits; great price deals, art and cultural sites without crowds and long waiting and a fine weather. 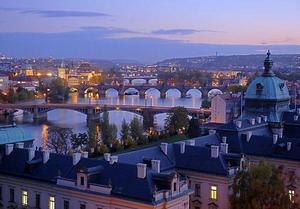 Plan your next city break in Prague and visit us at the Prague Marriott Hotel soon!